The snavian family is consisted of serpentine bird creatures that bury themselves underground and ambush surface dwelling prey. The Snavians, specifically Snagrets, are one of most diverse families after the grub-dog family, having adapted to numerous climates and environments across planet PNF-404. They are found or referenced in all three Pikmin games, often constituting boss fights. In Pikmin, only Burrowing Snagrets appear, in The Forest of Hope and in Challenge Mode. In Pikmin 2, they appear in greater numbers and variety, particularly in the Snagret Hole. Finally, a Burrowing Snagret also appears in Pikmin 3 in Twilight River, and in Mission Mode. Snagrets, which is the main type of enemy in this family, are in the Shiropedes genus. The family also consists of Burrowing Snarrows, but they are only mentioned and are part of an unconfirmed genus, possibly even the one same one as its Snagret counterparts. The Burrowing Snagret is an enemy in the Pikmin games that hides underground, waiting to burst out when Pikmin approach. They are able to quickly snap up Pikmin on the ground with their beaks. Although the Snagret's whole body is vulnerable, it sustains most damage when its head is attacked. When killed, it explodes, yielding many Pellets in Pikmin, leaving only its head in Pikmin 2, and leaving the entire corpse in Pikmin 3. In the second game, they are smaller and have lower health, making them less of a threat, and in Pikmin 3, if they miss a peck, their beak gets stuck in the ground momentarily. The Pileated Snagret is a larger, rarer, and more dangerous species of the Snavian family. It has a green, scaly body, and a bright orange head. It is called "pileated" because it has a crest of feathers on its head, and its eyes are decorated by some eyebrow-like features. The Pileated Snagret behaves much like the Burrowing Snagret, but it is able to completely emerge from the ground and hop around on one clawed foot. This means it can chase its prey, and makes its head harder to reach. This is a creature that was mentioned by Olimar in Pikmin and Pikmin 2, but has not been seen in any game yet. It was recorded by Olimar to look almost exactly like a Burrowing Snagret, however it can be told apart by the presence of wing and tail markings when it is pulled from the ground, which the Burrowing Snagret lacks, as well as the Snagret having a blue feather hue that the Snarrow does not. Even though its family is unknown, its relation to the other members of the Snavian family make it likely that that is its classification. In an early trailer for Pikmin, a Snagret-like enemy can be seen emerging from the ground, but it is colored almost entirely white (see image). This could be a Burrowing Snarrow or simply an early version of the Burrowing Snagret. "Snavian" is a portmanteau of "snake" and "avian", given their snake-like bodies and bird heads. Some members of this family use the word "Snagret" in their name. This seems to be a combination of the words "snake" or "snag", which means "to catch", and "egret", a kind of bird resembling the Snagrets. 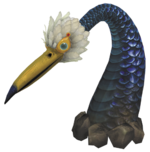 Their Japanese names also use the words ヘビガラス?, meaning "Crow Snake"; this is because of the enemies themselves being a combination of a snake and a bird – likely a crow. The term Shiropedes in their scientific names denotes the genus, and is a word made up of pedes, which is Latin for "foot", and shiro. The origin of shiro is unknown, although しろ? does mean "white" in Japanese. This page was last edited on April 16, 2019, at 16:17.